Stephen Brader caught this 25lb 12oz carp on the Sand Lake at Float Fish Farm Fishery. Float Fish Farm Fishery has been really busy with matches throughout the holiday period. The Wagtail Pool has been in reasonable form and Roy Wells topped a match there from peg 10 with 26lb followed by Kevin Peacock in second place on 7lb 9oz. In the latest match on the same lake the carp started to feed as the bitterly cold weather gave way to milder conditions. 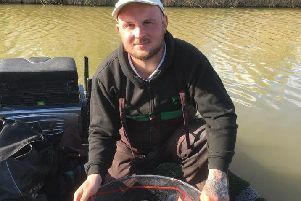 Top rod with 34lb 6oz from peg 10 again was Simon Dow. He fished a small feeder for 34lb 6oz. Runner-up was Andy Adams on peg 18 with 31lb 13oz and section winners were Mick Linnell with 15lb 13oz and Alan Forrest on 10lb 4oz. Float Fish Farm Fishery has come a long way in a relatively short time, but far from resting on his laurels fishery owner Dale Hudson has some big, bold plans to move the fishery up another level with heavy emphasis being placed on the big carp scene as well as catering for the match and pleasure anglers. Home Lake will be getting a stocking of double-figure carp in the spring while Sand Lake will see yet another carp of 30lb plus stocked. Lapwing has been a revelation since it opened and those fishing this lake will also be able to target big mirrors to 32lb that will be stocked early this year and two more fish of 40lb are expected to be introduced later in the year. The big news for match and pleasure anglers will be the opening in Spring 2018 of a new lake to be called Skylark which should hold around 20 pegs so it will be ideal for club matches. Obviously with more and more cars using the complex the roadways around the lakes will be upgraded and we will see tarmac going down as soon as the weather improves and maintainence work is completed.